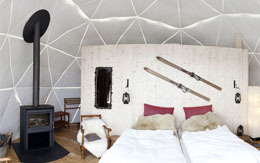 Snuggle up and be cozy this winter in a geodesic dome built to withstand the frigid elements while providing a warm, welcoming and spacious suite. Ideal for experiencing the beauty and splendor of our natural environment while ensuring a high level of comfort, your guests will enjoy world-class accommodations during their next visit in an eco-resort dome. When people think about traveling to France, they don’t always think of the snow-tipped peaks in the Alps. 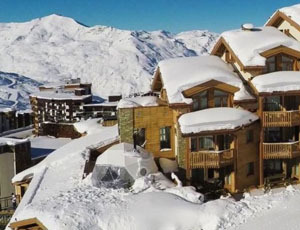 Val Thorens, France is the highest resort town in Europe at 7,545 ft elevation. 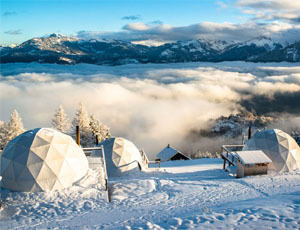 Located just 20 miles away from the border of Switzerland this world-class resort offers remarkable terrain and equally amazing accommodations. 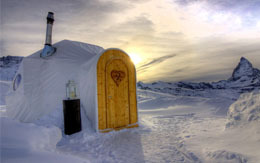 Pacific Domes has two beautiful domes nestled among a snowy igloo village in Zermatt, Switzerland. The location has an altitude of 2727 meters at the Gornergrat, which is right next to Switzerland’s most famous mountain: the majestic and legendary Matterhorn. 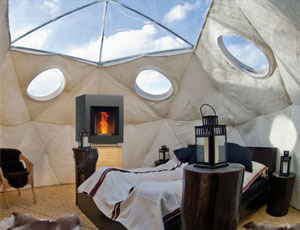 This innovative hotel, made up of geodesic domes and a central chalet, achieves the impossible: making cold-weather camping an appealing prospect. 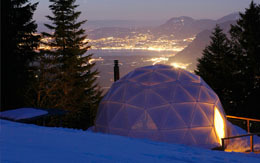 Whitepod invites guests to get away from it all in one of its eco-friendly, igloo-esque domes.